This coded magnetic safety switch with non-contact actuation, is a compact neat solution to sliding, hinged or lift off guard applications. 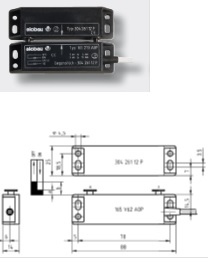 The 165 series safety switch from elobau is an ideal alternative to traditional ‘tongue’ or ‘key’ type switches. The switch is based on a standard size which is used by most manufacturers for other machine safety applications. The dimensions of the 165, illustrated below, confirm the compact design of this switch. 2 x NO contacts, or 1 x NO and 1 x NC contacts. Detent design provides a holding force of 20N.